Touring Car (TC) – This class is for smaller sedans and sports cars which are allowed some performance modifications. Examples of vehicles competing in this group include: Honda Accord, Mazda MX-5, Volkswagen Golf, Nissan Altima, Volkswagen Jetta and Nissan 370Z. Touring Car A (TCA) – Many of the cars competing in this class are the same as those found in Touring Car. What sets them apart is the minimum amount of modifications that can be made – most changes are to improve the safety of the vehicles. At the 2015 Firestone Grand Prix of Saint Petersburg, Grand Touring Sport drivers would compete in two fifty-minute races (Rounds 3 & 4 of the 2015 season) around the fourteen-turn 1.80-mile temporary street course. Twenty Grand Touring Sport competitors sit on the grid before the start of round three. 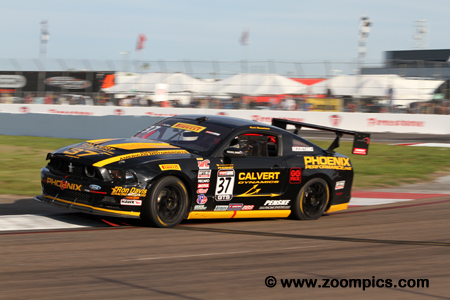 On the pole is four-time Pirelli World Challenge winner, Dean Martin in the No. 50 Rehagen Racing prepared Ford Mustang Boss 302. 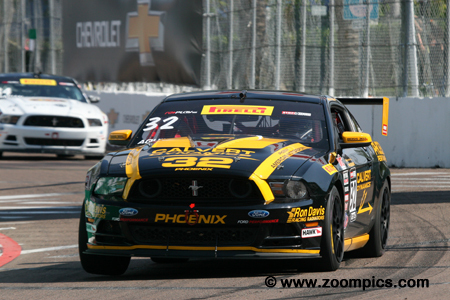 On the outside of the front row is sports car racing veteran, Spencer Pumpelly competing in the iTrackzone.com Ford Mustang Boss 302. Qualifying on the pole for the weekend’s first event was Dean Martin driving a Ford Mustang Boss 302. Martin got a great start when the lights turned green and led the field into corner one. Late in the race, it appeared that he would be challenged by Kurt Rezzetano but Martin was able to hold on for the victory. He also turned the fastest gave lap which gave him the pole for round four. Passes by Spencer Pumpelly, Andrew Aquilante and Rezzetano left Martin fourth in the finale. 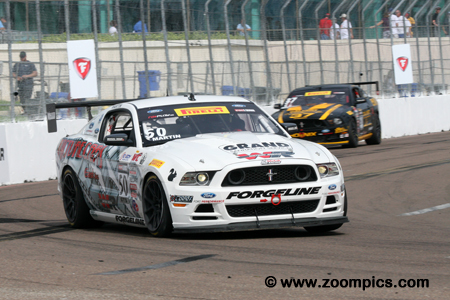 Sharing the front row in race one was Spencer Pumpelly driving a Ford Mustang Boss 302. 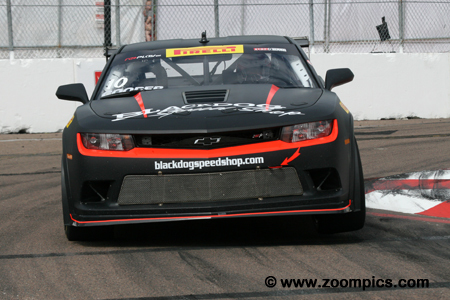 At the start, Pumpelly was overtaken by the third fastest qualifier, Kurt Rezzetano. 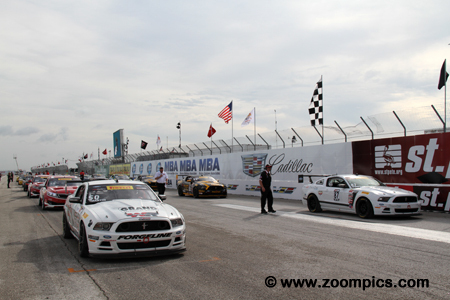 Pumpelly maintained his position and was third at the checkered flag. Based on his fastest lap in the first race he started fourth in Saturday’s event. Martin and Rezzetano went wide in turn four on the first lap and Pumpelly slipped past. He held onto first and won by 3.0-seconds. 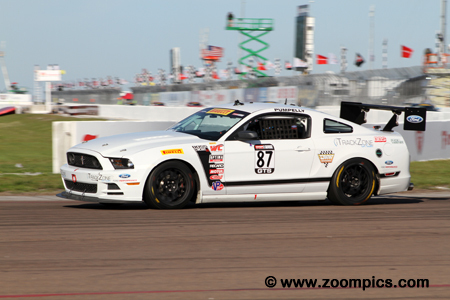 Kurt Rezzetano, racing a Phoenix American Motorsports prepared Ford Mustang Boss 302 qualified sixth for race one but jumped into second before turn one. He charged late in the contest but finished 0.686-seconds behind the winner, Dean Martin. Starting second on Saturday, Rezzetano had a terrific battle with Andrew Aquilante and Spencer Pumpelly – he was in third place at the checkered flag. Andrew Aquilante recorded a time in qualifying that put him in the fourth position on the grid. Unlike his teammate, Kurt Rezzetano, Aquilante made a poor start and spent the remainder of the race trying to catch up. He had moved into fourth place when he retired on lap-19 with a mechanical issue. With repairs made, Aquilante started third the following day. After some close racing with Spencer Pumpelly and Rezzetano he finished second. Driving the No. 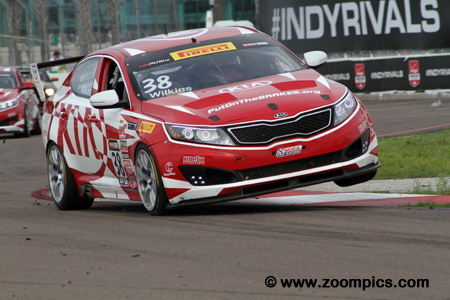 38 Put On The Brakes.Org Kia Optima was Canadian Mark Wilkins. Wilkins was gridded in the third position for round three. He lost a spot on the first lap and had a spirited battle with his teammate, Ben Clucas. As the contest progressed, he was passed by Jack Baldwin, Kris Wilson and Michael Cooper and finished eighth. Wilkins started seventh on Saturday but was overtaken by the Chevrolet Camaro of Cooper and finished eighth. Grand Touring Sport point’s leader, Kris Wilson failed to set a time in qualifying and started nineteenth in the twenty car field. Wilson gained fourteen positions during Friday’s race and won the VP Racing Fuel Hard Charger Award. Wilson’s time in Friday’s contest gave him the fifth starting spot for Saturday’s event. 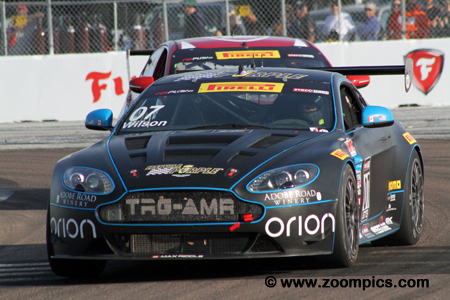 He finished seventh driving the Royal Purple sponsored Aston Martin Vantage GT4. Michael Cooper drove the No. 10 Camaro and won the season’s second race at Circuit of the Americas. At Saint Petersburg, the Z28s appeared to be no match for the competition. Cooper produced the best results for the Chevrolet teams – a seventh place finish in the weekend first race and a fifth the following day. He also won Optima Batteries Best Standing Start Award for gaining six positions during the standing start in round four. 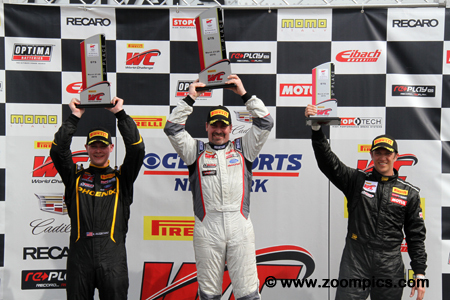 The round three Pirelli World Challenge Grand Touring Sport podium. In the center, is the victor, Dean Martin. This was World Challenge career win number five for Martin – all his victories were on temporary street courses. To his right, is sixth place starter and runner-up, Kurt Rezzetano. 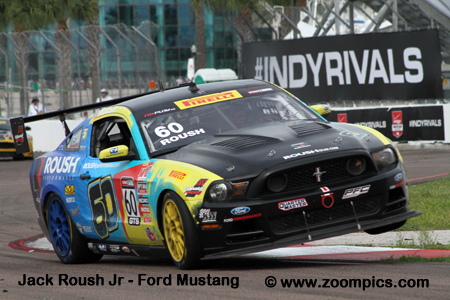 Completing a sweep of the podium for the Ford Mustang Boss 302 is Spencer Pumpelly.